Journalists, including those from The Yorkshire Post and Yorkshire Evening Post, have been making a lot of noise on Twitter recently. And, refreshingly, it’s not all been about bashing Brexit. 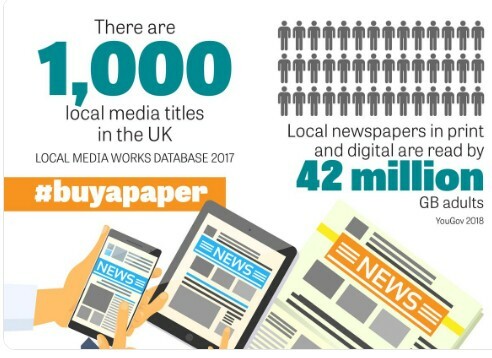 Posts have been raising awareness of #buyapaper, a campaign supporting the local newspaper industry and the vital role it plays in our communities. Such has been its backing it has been a regular national trending topic, with people liking, sharing and unashamedly revealing their love for local printed news. As a former journalist with the Telegraph & Argus and The Yorkshire Post, newspapers have always held a special place in my heart. So, it’s been pleasing to see the positivity towards the local press and the hard working and talented teams who put them together, often with meagre resources. At a time when public trust in our political system is at an all time low because of Brexit, Trump and the ‘fake news’ agenda, local newspapers are proving a welcome antidote. According to recent research from You Gov, these titles are more than three times more trusted for news and information than social media platforms such as Facebook and LinkedIn. Their editorial teams are trusted experts, close to the agendas that matter to their readers, and have often been in post for many years, enabling them to build relationships with contacts and communities that their national colleagues can’t. The #buyapaper campaign also has another important aspect: print newspaper sales continue to decline as content is increasingly consumed online. Allied to this, publishers battle between maintaining print advertising revenues while trying to grow commercially online. Indeed, one of the driving forces for #buyapaper has been a renewed call to protect local journalism after Johnston Press, the owner of 200 regional titles, underwent a pre-pack administration deal late last year. This move saved many jobs but left people with further questions about what the future of titles, including The Yorkshire Post and Scotsman, holds. Printed newspapers at a local level certainly have a future. They allow journalists to be more analytical, look behind the top line ‘breaking news’ headlines often found online and to explore subjects in greater detail, as well as campaigning on subjects that can make a positive difference to their readers’ lives, such as transport, health and regeneration. To remain relevant, they need to focus on providing their audiences with the right content. It’s no good writing stories that younger people will be interested in for the print edition if these people are predominantly reading online. Getting this right not only keeps established readers engaged but also influences those audiences to think more positively towards that title because they appreciate that editors and journalists understand their mindset. That’s not to say there won’t be further change. It’s likely that some dailies may be forced to go weekly, and other titles disappear altogether through mergers or economic viability arguments. However, as Mark Casci, business editor at The Yorkshire Post, recently told me, he and his journalist colleagues are focused on producing quality stories for their readers, not worrying about forces outside their control. This year is set to be a massive one for Leeds and the wider region thanks in part to Channel 4’s decision to move to the city. Our local newspapers will have a central role to play in continuing to be a positive champion as development continues at pace and God’s Own County is promoted as a great place to live, work and play.